Published: Feb 23, 2016 · Modified: Apr 12, 2019 · By Jen Sobjack · This post may contain affiliate links. 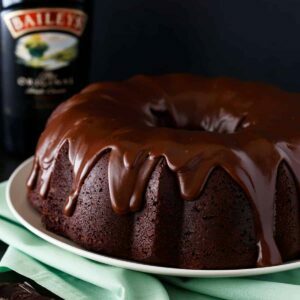 Boozy chocolate lovers, this Irish Chocolate Coffee Bundt Cake is for you! 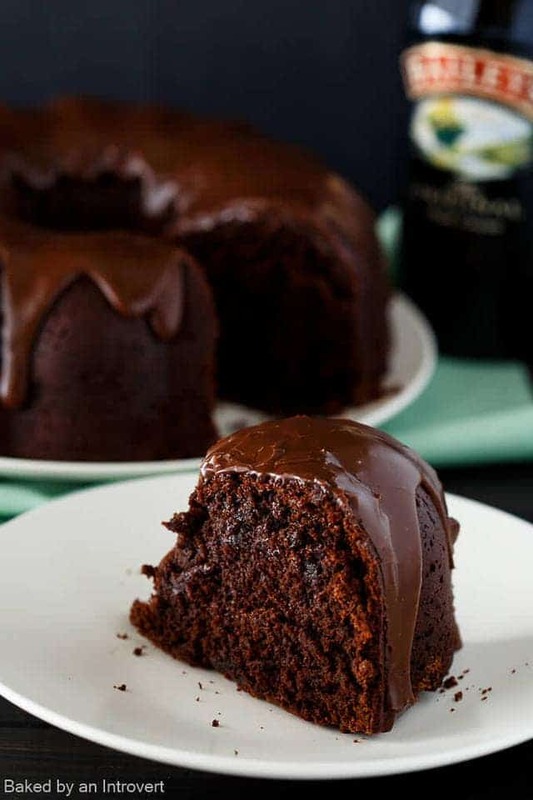 From the made from scratch double chocolate cake to the rich chocolate glaze, this cake is the ultimate St. Patrick’s Day treat. With each forkful, you get an intense chocolate flavor, hints of coffee, and delicious Irish Cream liqueur. No other chocolate cake can compare! St. Patrick’s Day is one of my favorite holidays because it gives me an excuse to make a decadent boozy cake. This tequila sunrise cake and this eggnog cake are just a few examples of my love for booze in baked goods. Today’s bundt cake is more than enough to feed a crowd. It has intense chocolate flavor and is infused with coffee and sweet Irish Cream liqueur. You are going to love how moist and crumbly this cake is. The coffee brings out all the best in the chocolate. You know I’m a huge fan of coffee-infused chocolate! It really heightens the flavor and pairs wonderfully with the Irish Cream. 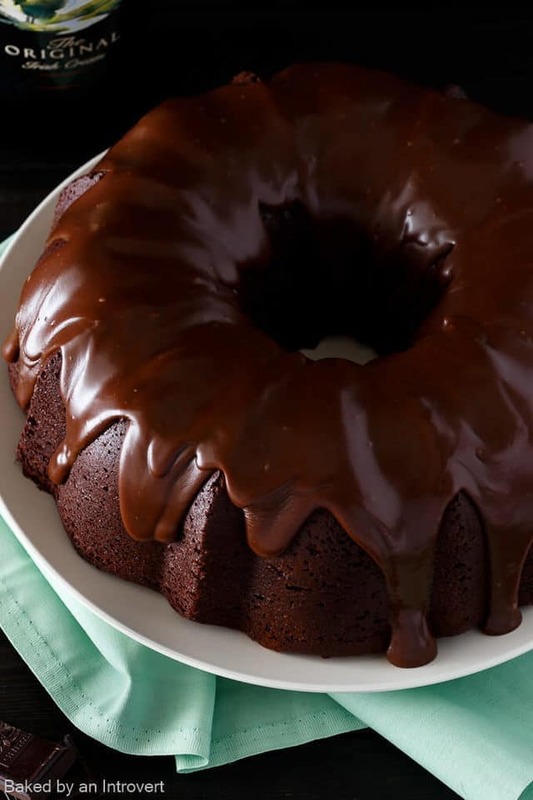 The cake is topped with a decadent chocolate Irish Cream glaze. This is the best glaze ever. It’s sweet, chocolatey, melts in your mouth, and has a strong boozy kick. This recipe is definitely one you should make this year! Your St. Patrick’s Day won’t be complete without it. The cake is super easy to make and loaded with boozy chocolate flavor. The glaze is done in a matter of minutes and the cake is easy to whip up. It can also be made a day ahead and then glazed just before serving. A few things to note when making this cake. It is a fudgy chocolate cake and will stick to the pan if it isn’t greased properly. I like to spray it with nonstick baking spray. It’s a mixture of oil and flour and does an amazing job of releasing cake. I also like to dust cocoa powder over the baking spray for an added measure. Cocoa powder is best for chocolate cakes because it won’t leave behind a white powdery residue the way flour will. It’s also very important to let the cake cool in the pan for at least 20 minutes before trying to invert it onto a cooling rack. I’ve inverted this cake too soon before and it crumbled into pieces. Allowing it to sit longer in the pan will help it “set” before you turn it out. What can I substitute for the Irish Cream Liqueur? If you want the Irish cream flavor, you can try the Irish cream coffee creamer. Otherwise, just use milk. Will this cake freeze well? Yes, it will. Freeze it without the glaze. Allow it to thaw in the refrigerator overnight and glaze it before serving. Can I use Kahlua instead of Irish Cream? Can I make this cake in a 9×13-inch pan instead of a bundt pan? I haven’t tried this myself but I believe it should work okay. Just keep a close eye on the bake time as it should only need about 30 minutes in the oven. Boozy chocolate lovers, this cake is for you! 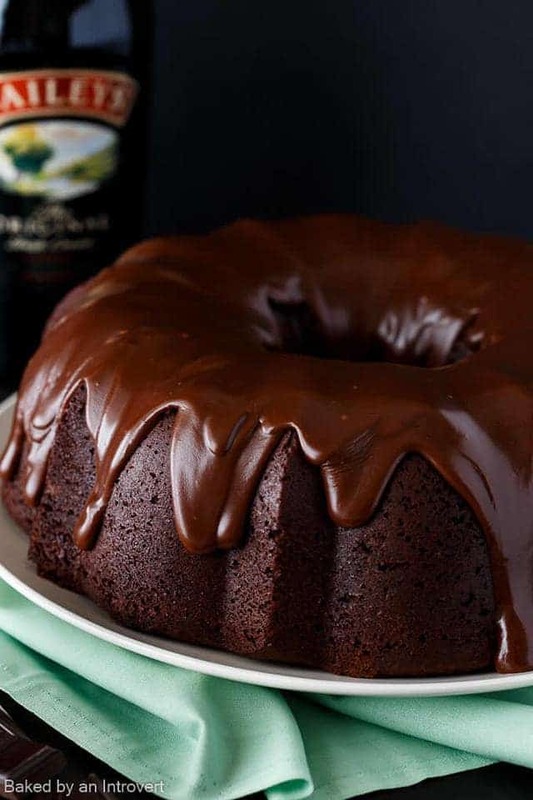 From the made from scratch double chocolate cake to the rich chocolate glaze, this Irish Chocolate Coffee Bundt Cake is the ultimate St. Patrick’s Day treat. With each forkful, you get intense chocolate flavor, hints of coffee, and delicious Irish Cream liqueur. No other chocolate cake can compare! Coat the inside of a 12-cup bundt pan with nonstick spray and lightly sprinkle with cocoa powder. Tap out any excess. Adjust the oven rack to the lower-middle position and heat to 350ºF. Combine the chocolate and oil in a microwave-safe bowl. Microwave for 15 seconds intervals, stirring well between each one until the chocolate is melted and smooth. Set aside to cool slightly. In a separate bowl combine the flour, cocoa powder, baking soda, and salt. Stir with a whisk. Set aside. Using a stand mixer fitted with the paddle attachment, beat the butter and sugar together on medium-high speed until fluffy, about 5 minutes. Beat in the sour cream and vanilla. Add the coffee granules and melted chocolate. Mix until well combined. Add the eggs, one at a time, mixing well after each addition. Add half the flour mixture, followed by the Irish cream, and then the remaining flour mixture. Mix well after each addition. Pour the batter into the prepared pan and bake for 45 to 55 minutes or until a wooden toothpick inserted into the center comes out clean. Cool in the pan for 20 minutes. Invert the cake onto a parchment-lined wire rack and cool to room temperature. Transfer to a serving platter and drizzle with glaze. Place the chocolate, Irish cream, and butter in a medium heatproof bowl set over a pot of barely simmering water. Stir continuously until melted and smooth. Remove from heat. Gradually whisk in the powdered sugar, 2 tablespoons at a time, until well combined, smooth, and a spreadable consistency.